More than brick, stone and stained glass, Northwestern’s named buildings have a history to share. Ever wonder about Wieboldt, Kresge or Annie May Swift? Shanley, Ward or Alice Millar? Who were these Northwestern namesakes? During the course of its history, Northwestern has named buildings for an ardent abolitionist, a prominent prohibitionist, a Bronx dance teacher, an anti-regulation attorney and a mail-order king. The entire Chicago campus was originally named for a fallen war hero. And one performance hall was a very special golden anniversary gift. 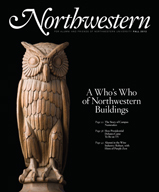 Northwestern has nearly 200 buildings on its stateside campuses. Every one has its own story to tell. Here are a few.